Woody Williams became a Cardinal on my birthday. It’s a strange reason to latch on to a player or to feature them in this countdown, but there you go. It’s not like 19 has a storied history–save for the few like Pagnozzi and Iorg, most only wore it for a season or two. It’s a number that will probably eventually land on someone that winds up getting it retired, since so many of the lower numbers in Cardinal history are already reserved in that fashion and ballplayers tend to like lower numbers, for whatever reason. Still, there’s not a lot of history along with this one, save perhaps Jay’s part in keeping the 2011 World Series alive in Game 6. The situation with Ray Lankford had gotten pretty bad in St. Louis. For all of Tony La Russa‘s virtues and laudable attributes, sometimes dealing with veterans at the end of their rope (or apparently there) wasn’t his strong suit. And, to be fair, it wasn’t all on TLR’s side. Lankford wasn’t producing and he wasn’t exactly being a wonderful clubhouse presence at the time. So two days after the non-waiver trading deadline, on August 2, 2001, Lankford was sent out to San Diego for a veteran innings-eater that was struggling for them as well. There are reasons while Walt Jocketty was considered a strong GM and moves like this validated that ranking with authority. Lankford did hit .288 with four home runs for the Padres after the deal, but scuffled again in 2002, playing in only 81 games and hitting .224. After sitting out a year with injury, Lankford actually returned to St. Louis to again play for La Russa, this time with a little different outlook on things. Williams, however, blossomed under Dave Duncan. He went 7-1 with a 2.28 ERA down the stretch with the Cardinals and continued that run into the postseason, where he allowed a run in seven innings against the Diamondbacks, winning Game 2 of the NLDS. 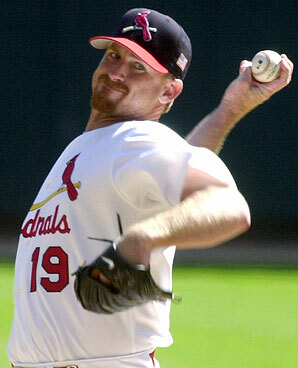 He spent three more years with the Redbirds, putting up a total line of 45-22 with a 3.53 ERA and a 3.82 FIP. He even got the chance to pitch in the World Series, starting Game 1 of the 2004 Fall Classic. Of course, we know that didn’t go well for him (seven runs in 2.1 innings) but given the way that Series went, you can’t say that he lost the trophy for the Cards. Williams had one more good year in him after he left St. Louis, but there’s no doubt that he played his best under the Arch. And he had a little more impact on the club, though it came before he became a Cardinal. Pat Hentgen and Williams, while in Toronto, helped mold a young prospect in their system. 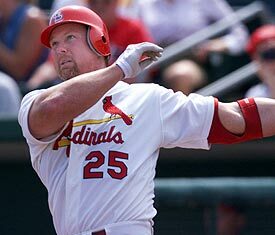 The fact that he helped Chris Carpenter become Chris Carpenter is just icing on his St. Louis cake!